Get the perfect ambiance for your event. Whether it may be a Jazzy or easy listening evening for your cocktail hour, or a party atmosphere with Reggae and Soca to get the dance floor moving, Enchanting Steelpan offers a wide array of music to set the perfect mood for your function. I specialize in weddings, parties, corporate events and banquet receptions. I also offer services for your holiday parties during the festive season. Andy was great to work with -- well organized and professional and well on-time setting up, despite the difficulties in getting to and unloading presented by our venue. Many of our guests (a business reception with several from the Caribbean) commented on how much they enjoyed the "perfect" background music and Andy's smiling presence. Thank you, Shelley. The pleasure was all mine. A smile and a happy crowd it what I aim for. 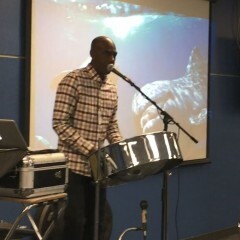 Andy of Enchanting Steelpan was AWESOME! We can't say enough good things about Andy. The only day this summer it rained and we had our bbq. We were thinking of cancelling due to the weather, but Andy came anyways. We waited out the rain, he set up, the clouds parted and we had a great time. Andy was extremely professional, personable and interactive with the guest and great with all the kids. Everyone has nothing but good things to say about the songs he selected and how he played them. Already planning to have Andy back next year!! Thanks very much Charlotte, Paul and my man Bryce! I wanted to bring a tropical feel to the party, but not a tropical storm! It was a pleasure for playing for neighbourhood and I am so pleased you enjoyed it. We were so pleased with his music, fun, upbeat as well. He was on time. And was fast to set up, our 50 guests so enjoyed th 1.5 hours of music. We had Andy play the steel drum during our cocktail style reception. He did an amazing job and had everyone vibing to the music! He played a wide range of songs from classics to new school. Highly recommended! He was so awesome. Everyone enjoyed it and it set the tone for the entire day. Many of the guests were musicians and they were totally impressed. Thanks for the review, Carolee. I'm glad you enjoyed the music. Best wishes to you and Stephen as you start your lives together. Andy provided us with great entertainment at our Christmas party. He played a lot of chart toppers, Caribbean music as well as Christmas classics. He showed up at our house at least half an hour before start time and was very professional. My seven year old was thrilled when he played "Blurred Lines." We can't wait to have Andy for our next holiday party. The client should expect the utmost in professionalism from Enchanting Steelpan. Andy Phillips arrives half an hour before the venue, set up and ready to play. He is a performer who stays current and aims to please his crowd. A seasoned professional who puts the client first, Andy Phillips has been entertaining crowds on the steel pan for several years and has had rave reviews. 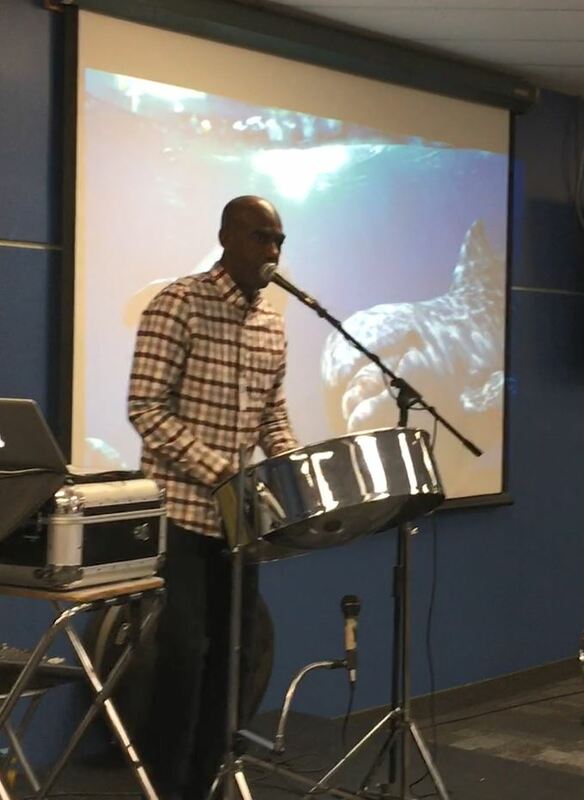 Starting out as a youth in his native Trinidad and Tobago, Andy began playing the steel pan under the mentoring and influence of his older brothers. His love of music would take him around the globe, as he entertained in banquets, weddings, celebrity galas and cruise ships, just to name but a few. Andy's vision is simple as he says, "My goal is to bring joy to the hearts of people through music, as this is what it has done for me." Recent review: He was perfect for my husbands birthday pool party! Loved it all. Should have had him play longer!